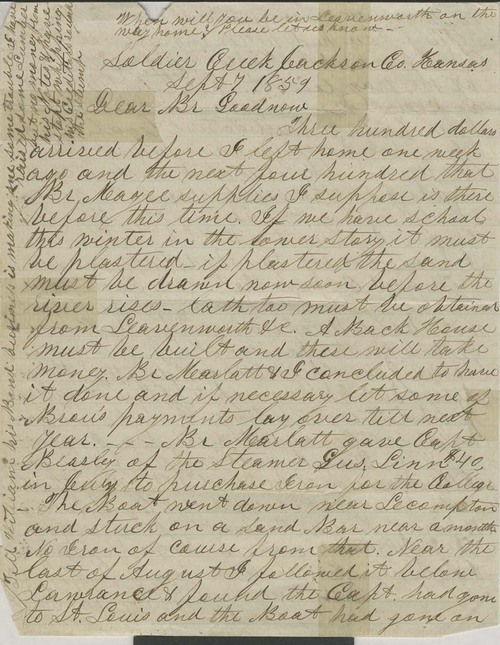 Joseph Denison wrote from Soldier Creek, Jackson County, Kansas Territory, to Isaac Goodnow. Denison reported on the construction of the Bluemont College building, advising him that the lower floor would need plastering before classes could be held there in the coming winter. He recounted the sinking of the steamer "Gus Linn," which was carrying building supplies for the College, on a sandbar in the Kansas River. Denison recommended that Goodnow purchase a common seal for the Trustees of Bluemont College to use on legal documents.